Miranha imbellis (Walker, 1858) can be found in Mexico and Central America. 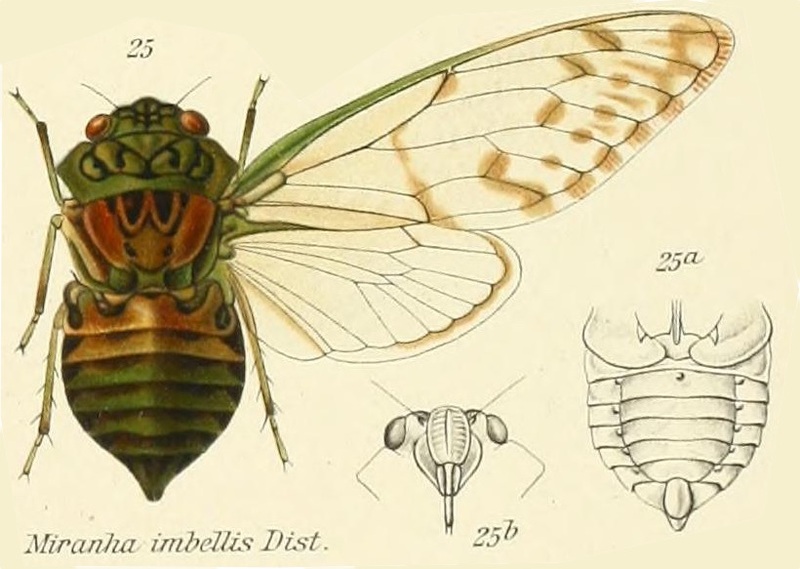 Miranha imbellis is a member of the Zammarini tribe of cicadas, known for their Dracula/Vampire-style pronotal collars. One way to sort the M. imbellis from other members of this tribe is the infuscations (dark colorations) on its wings are relatively pale compared to Zammara cicadas, but not absent like the Odopoea azteca or Daza montezuma, and more obvious than Odopoea degiacomii. See this page to compare. Characters. — Head (including eves) a little narrower than base of mesonotum. the front moderately prominent, but only about half the length of vertex, lateral margins of vertex a little convex; pronotum about as long as mesonotum, its lateral margins ampliate and medially angulate ; abdomen about as long as space between apex of head and base of cruciform elevation, its lateral areas above moderately oblique, the tympanal orifices inwardly covered but outwardly exposed; abdomen beneath with the disk oblique on each side, but with the lateral margins broadly subreflected ; rostrum passing the posterior coxœ; opercula small, transverse; tarsi three-jointed ; tegmina and wings hyaline, the first with eight apical areas, and the basal cell considerably longer than broad.